Lightweight with breathable lining split-sole shoe. Ideal choice for Zumba. Available in: Black with pink trim / Black with patent trim. 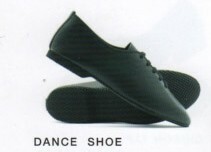 Lightweight with breathable lining split-sole shoe.